Muttukrishna Sarvananthan has undertaken incisive, insightful, and foresightful policy research during the past twenty years (1999-2018) of post-doctoral professional career. http://orcid.org/0000-0001-6443-0358 (h-index 9, i10-index 9 as of January 2019) Muttukrishna Sarvananthan has undertaken impactful peer reviewed research, public dissemination in peer reviewed international and regional journals, and public intellectual advocacy through the mass media (both print and electronic) in Sri Lanka. The year 2019 marks three milestones for Muttukrishna Sarvananthan: It is fifteen years since the founding of the Point Pedro Institute of Development in 2004; twenty years since earning his Doctor of Philosophy degree at the University of Wales Swansea in 1999; and twenty-five years since his first peer-reviewed scholarly publication in the Economic and Political Weekly (EPW, India) in 1994. A total of 41 peer-reviewed scholarly publications have been the output during the twenty-five year period between 1994 and 2018, which includes 27 journal articles (i.e.66%), 8 book chapters, and 6 books/monographs. His academic publications have been consistent/regular; resulting in 2 publications per year, on average, during the twenty year period after earning his PhD (1999-2018). Out of the total of 41 publications, 33 are sole author publications (i.e.80%). His articles have been published in the journals of leading international academic publishers such as the Routledge (Taylor & Francis Group, UK), SAGE (India/USA), and Springer (Germany). He has also been a peer reviewer of several articles submitted to journals published by leading international academic publishers such as the Elsevier (Netherlands), Routledge (Taylor & Francis Group, UK), SAGE (India/USA), and John Wiley (USA). 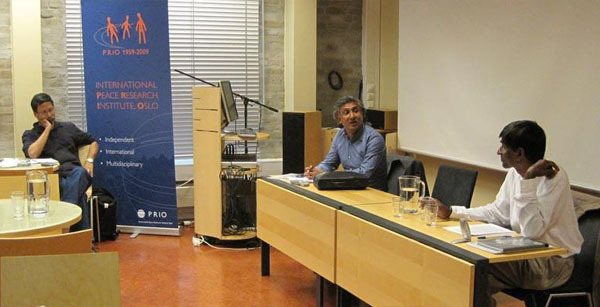 Muttukrishna Sarvananthan hails from Point Pedro and a Development Economist by profession. He is the Founder and Principal Researcher of the Point Pedro Institute of Development, Point Pedro, Northern Province, Sri Lanka, which he founded in 2004. He is the foremost authority on the Economies of the Eastern and Northern Provinces of Sri Lanka. 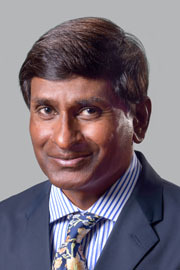 Muttukrishna Sarvananthan is personally a Ceylonese (known as Sri Lanka since 1972) by birth and Sri Lankan by citizenship and domicile; but professionally, and in terms of work ethics, a British, having been trained as a Development Economist there during the course of successfully completing three postgraduate degrees in England and Wales. He has worked as a Consultant to the Ministry of Finance and Planning, various private research institutions and international consultancy firms (e.g. Oxford Analytica), Canadian International Development Agency (CIDA), German International Cooperation (GIZ, formerly known as GTZ), International Labour Organisation (ILO), United Nations Development Programme (UNDP - both the country office and the Asia Pacific Regional Centre Colombo), and the World Bank (IBRD) in Sri Lanka undertaking field survey-based and desk-based applied empirical research studies on contemporary economic and social issues (civil conflict, dispute / conflict resolution, gender and development, international trade, labour market, local / regional economic development, macro-economy, new sources of international development finance, peace, poverty, terrorism, etc) confronting Sri Lanka and beyond, field evaluations of agriculture, small enterprise, governance, peace-building, and post-disaster projects in Sri Lanka, post-conflict / disaster needs assessments in Sri Lanka, and reviews of fiscal and monetary transparency in Sri Lanka. He has been an intern at the World Bank headquarters in Washington, D.C. in 1996 as well. He has undertaken collaborative survey-based research with the University of Mannheim (2018) and University of Heidelberg (2009) in Germany, Rand Corporation in California (USA) (2017-2018), and the Indian Council for Research on International Economic Relations (ICRIER) in New Delhi (India) (2000-2002). Muttukrishna Sarvananthan is periodically consulted by the diplomats at the Embassy or High Commission of Australia, France, Germany, India, Japan, Norway, United Kingdom, and the United States of America in Sri Lanka, and visiting government officials from the foregoing countries to Sri Lanka, about the economic, political, and social situation in the Eastern and Northern Provinces of Sri Lanka. He used to be regularly interviewed by the Tamil service (Thamil Ozai) of the British Broadcasting Corporation (BBC) in London (which is now based in New Delhi). 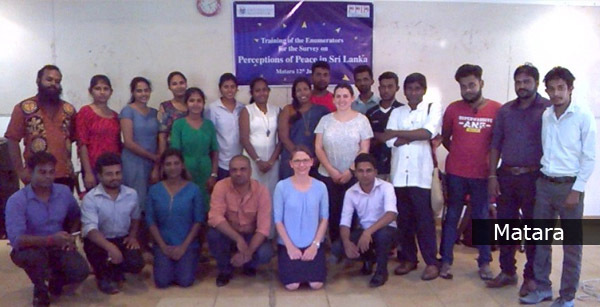 Further, he has been an academic tutor, supervisor, and guest lecturer on conflict resolution and security studies for the United Nations University for Peace (2005-2008) and the University of Bradford (2005/6) respectively in Sri Lanka. 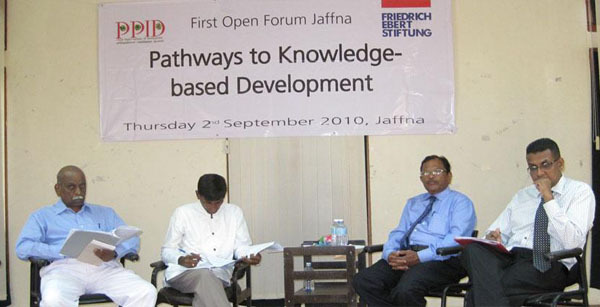 Furthermore, Muttukrishna Sarvananthan has been an external examiner of Ph.D. theses on Entrepreneurship in the Northern Province of Sri Lanka submitted to the University of New South Wales in Canberra in 2015 and on the Shadow Economy in Sri Lanka submitted to the Jawaharlal Nehru University in New Delhi in 2006. Besides, he was also a member of the international editorial board of the Contemporary South Asia journal published by Routledge from 2004 until December 31, 2016. Since July 2017, he is a member of the Board of Reviewers of the South Asian Journal of Human Resources Management journal published by SAGE Publishing. https://us.sagepub.com/en-us/nam/south-asian-journal-of-human-resources-management/journal202252#editorial-board Moreover, he has been a peer reviewer of number of articles submitted to Contemporary South Asia (Routledge) (2015, 2014 (2), 2013, 2009, 2008 (2), 2007, 2006, 2004 (3), 2003), Democracy and Security (Routledge) (2018), Disasters (John Wiley) (2007), Development in Practice (Routledge) (2016), International Feminist Journal of Politics (Routledge) (2018), South Asian Survey (SAGE) (2018), Third World Quarterly (Routledge) (2013), and World Development (Elsevier) (2017, 2015) journals during 2003-2018. 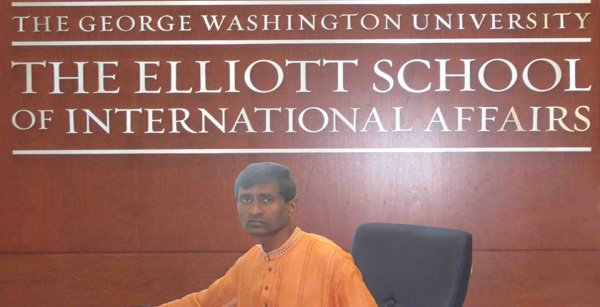 Muttukrishna Sarvananthan was an Endeavour Research Fellow at the Global Terrorism Research Centre (GTReC) of the Monash University in Melbourne from September 2011 to February 2012, and a Fulbright Visiting Research Scholar at the Elliott School of International Affairs, George Washington University in Washington, D.C. from October 2008 to July 2009. 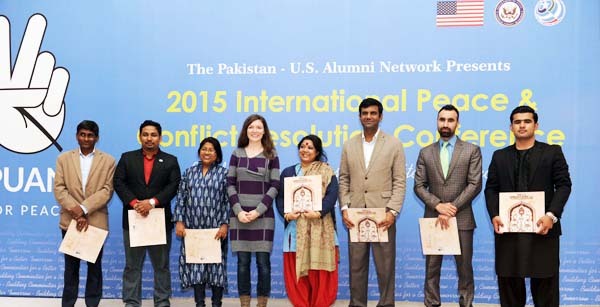 He was a participant in the International Visitor Leadership Program on ‘Tamil Diaspora – Post Conflict Reconciliation’ organized by the United States Department of State from August 06 – 24, 2012 in the United States of America. He has authored books titled The Economy of the Conflict Region: from economic embargo to economic repression (2007&2008), People’s Verdict on Tsunami Recovery in Sri Lanka (2007), Children of War: Aspirations and Opportunities (2007) (received the first prize under the research award scheme of the Sri Lanka Economic Association in 2008), An Assessment of Contraband Trade and Capital between India and Sri Lanka (2001), Impact of Civil Conflict on Women in Traditional Tamil Society (co-author) (1995), and Economic Reforms in Sri Lanka: post-1977 period (editor) (2005). 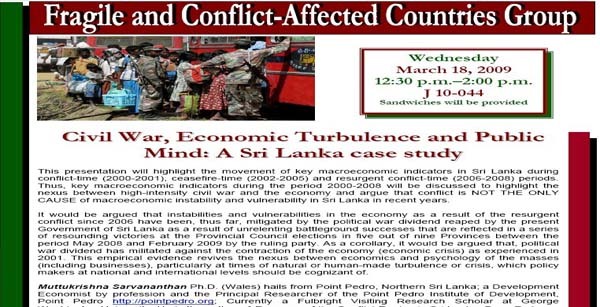 Further, he has published articles on Indo-Sri Lanka trade, poverty and income inequality, civil war and the economy, economic policies and strategies, gender and development, livelihoods, and terrorism in Conflict Trends (Durban) (2009), Contemporary South Asia (Routledge) (2011, 2008, 2004, 2002, 1999), Development in Practice (Routledge) (2017), Economic and Political Weekly (India) (2005, 2003 (2), 2001, 1994), Faultlines: Writings on Conflict and Resolution (New Delhi) (2004), GeoJournal (Springer) (2016), Indian Journal of Regional Science (Kolkata) (2009, 2004), Journal of Contemporary Asia (Routledge) (2001), Journal of Developing Societies (SAGE) (2017), Maritime Affairs (Routledge) (2018), Perspectives on Terrorism (University of Leiden and University of Massachusetts-Lowell) (2018), South Asia Economic Journal (SAGE) (2004), South Asian Journal of Human Resources Management (SAGE) (2015), South Asian Survey (SAGE) (2012), Sri Lanka Economic Journal (1995), Sri Lanka Journal of Social Sciences (1999), and the Third World Quarterly (Routledge) (2007). 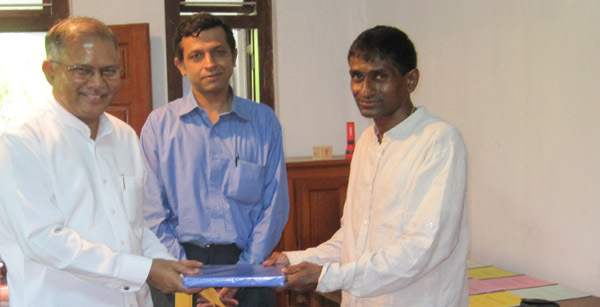 http://scholar.google.com/citations?hl=en&user=CYGaCwQAAAAJ (h-index 9, i10-index 9 as of January 2019) His research note titled “Recovering from the Tsunami: People’s Experiences in Sri Lanka” in Contemporary South Asia, Vol.16 No.3, September 2008 was amongst the top twenty articles downloaded from the publisher’s own portal during 2008. Muttukrishna Sarvananthan earned a Doctorate in Development Economics at the Centre for Development Studies, University of Wales, Swansea in 1999, Master of Science in Development Planning and Administration at the Department of Social Policy and Social Planning, University of Bristol in 1991, Master of Science (Economics) in Economic Development at the Department of Economics, University of Salford in 1989, and Bachelor of Arts (Honours) in Economics at the Kirori Mal College, University of Delhi in 1986. 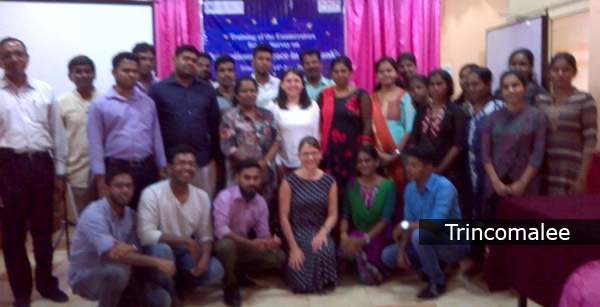 Besides, he has successfully completed teaching skills for graduate tutors course at the University of Wales, Swansea in 1998.